potential in urban drainage systems. Urban flood damage reduction strategies rely on rainfall intensity-duration-frequency data (IDF curves) as a key design input to drainage capacity assessment and rehabilitation studies. So there is keen interest in updating IDF curves based on the changing severity of severe storms and expected climate change impacts to rainfall characteristics. Analysis shows that Environment Canada's annual rainfall maxima trends, the data revealing increasing or decreasing storm intensities over time, can be used as indicators of whether IDF curve updates for design are necessary. Environment Canada does not update IDF curves frequently, but a new data product in the Engineering Climate Dataset can be used to determine if an upward or downward trend in rainfall severity is occurring at a climate station. These trends can guide as to whether IDF curve revisions are needed to reflect more extreme weather, based on observed storm characteristics. The image below shows long term Toronto maximum rainfall observations and trend lines (climate station 6158355) from idf_v2-3_2014_12_21_615_ON_6158355_TORONTO_CITY_t.pdf. The 't' in the Environment Canada file name indicates this is the trend file in their dataset. This and '*_t.png' format trends plots are provided with the version 2.3 data. The decrease in observed rainfall intensity over time as shown in the trend plots above results in decreases in IDF curve design intensities as well. Below the resulting trend in 5 minute intensities based on Environment Canada's extreme value IDF curve statistics shows a 5.5% decrease in design storm intensity for the most rare and severe 100 year storm intensity, and a 4.1% decrease in design storm intensity for the more common 2 year storm. Decreases in IDF intensity are shown for all storm return periods between 2 and 100 years. This suggests there has been no climate change shift in storm frequency or severity, and no IDF curve update is required for the Toronto area represented by this climate station ID 6158355. Ontario's cap and trade proposal in Bill 172 has been justified as a means to fight climate change and flooding by Liberal MPPs, but data clearly refutes the claims that storms are becoming more severe. Toronto climate change trends in severe rainfall - IDF curves show decreasing design rainfall intensities over all frequencies and over all durations that extreme value statistics are calculated. 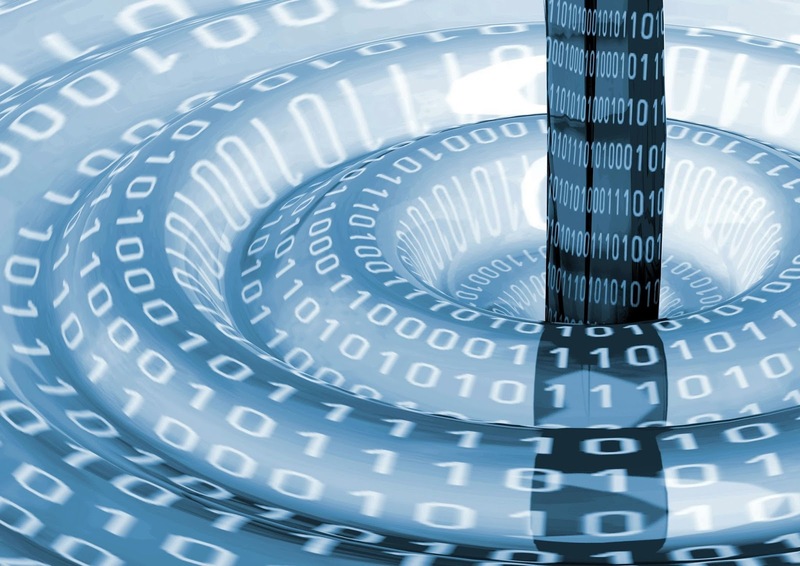 Data up to 2007 are from Environment Canada`s Version 2.3 Engineering Climate Dataset, data up to 2003 from Version 2.0, and data up to 1990 from pre-Version 1 hardcopy records. How can potential IDF trends due to climate change be determined for other climate stations in the Ontario region or across Canada? One can check the long term trends in annual maximum rainfall observations in the region of interest to assess if there are overall increasing or decreasing trends worth evaluating. To support this, the table below summarizes Environment Canada's extreme rainfall trend slopes for all durations for the most reliable stations (i.e., those with the longest records and most current data). 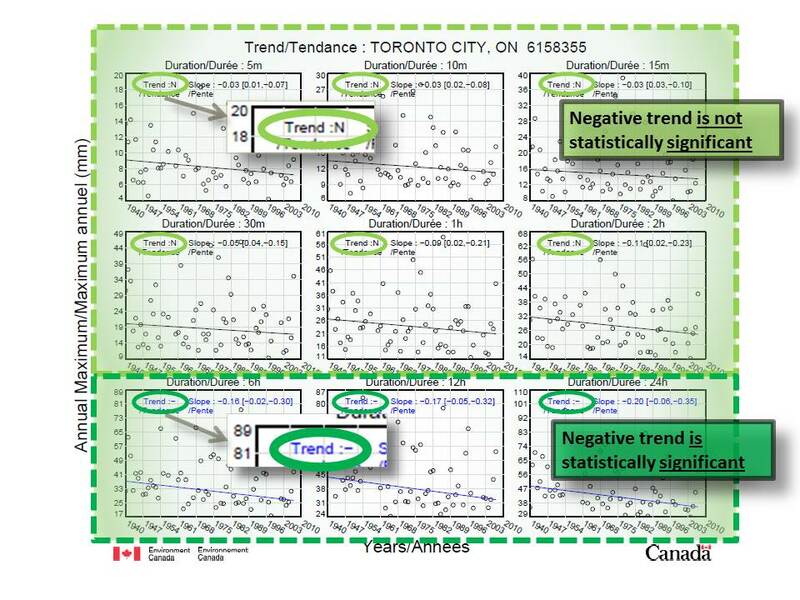 The trends in the nine Toronto station graphs above correspond to the nine colour coded table cells below, i.e., the first six short duration graphs (5 minute to 1 hour rainfall durations) correspond to the six light green cells in the table below. These mean decreasing rainfall intensity and no need to increase IDF curves based on more extreme storms. The last three longer duration graphs (2 hour to 24 hour durations) correspond to the three dark green cells in the table - these demonstrate strong decreasing intensity trends observations and, again, no need to update IDF curves based on more extreme weather - in fact IDF curves could be decreased based on the data. Canadian climate change trends in severe weather, extreme rainfall intensities over time, showing statistical significance (strength in IDF curve trends for rainfall design updates). Raw data source is Environment Canada`s Engineering Climate Dataset package, Version 2.3, available from Environment Canada`s ftp site. Across southern Ontario, trends are similar to the Toronto station, meaning mostly decreasing rainfall intensity trends (light green and dark green cells), such that no update in IDF curves is required to reflect historical changes in observed rainfall severity. Northern Ontario or other regions have more mixed trends but few stations with statistically significant trends (few dark green or dark red cells). The exception could be some Maritime / Newfoundland stations where there are more statistically significant increases. Western Canada weather stations meeting the screening criteria for reliability (45+ years of record and most current data no later than 2005) did not show any statistically significant trends. One has to wonder if Environment Canada scientists are being muzzled from widely sharing these basic facts because it does not support climate change mitigation policy. Trends at all Canadian climate stations, including those with shorter records and non-active sites, are available in a previous post for 15 minute durations (includes table and interactive map). An interactive map showing trends for all durations for all Canadian climate stations is available as well (all data is in map pop-up attributes, and station symbols are colour coded based on 5 minute duration trends). Why is rainfall intensity important? Urban flooding on table lands, beyond the river systems subject to riverine flooding, is often correlated with high intensity summer convective storms. This is so because such urban catchments are 'flashy' or fast responding, meaning the runoff and flow in infrastructure that causes flooding peaks shortly after the peak rainfall intensity occurs. In hydrological design terminology, this flashiness is expressed as the catchment's 'time of concentration', defining how long it takes for runoff from the most remote portion of the catchment to contribute flow to the outlet. Just as a crystal glass resonates with sound wave frequency, the flow from urban catchments resonates with (responds to) rainfall frequency defined on IDF curves. i. City of Guelph – Ward 1, Frequency Analysis of Maximum Rainfall and IDF Design Curve Update, Earthtech, 2007. Concludes that city would “prefer to retain the existing curves and higher values” as updated rainfall intensities were lower. ii. Updates of Intensity-Duration-Frequency (IDF) Curves for the City of Waterloo and the City of Kitchener, University of Waterloo, 2012: indicates “new IDF curves tend to be lower .. for rainfall durations up to one to two hours”. iii. Rainfall Intensity-Duration-Frequency (IDF) Curves RFP11-080 Engineering Design Criteria and Standards Update (DRAFT), fabian papa & partners inc., 2012. Found that “City’s existing criteria ... are more conservative than recently compiled statistics” and “up-to-date Environment Canada IDF Curves will result in lower storm intensities”. iv. Trends in Canadian Short‐Duration Extreme Rainfall: Including an Intensity–Duration–Frequency Perspective, Environment Canada, Atmosphere Ocean 2014: indicates “no detectable trend signal” across Canada an no regional increases in Ontario. v. Precipitation Intensities for Design of Buried Municipal Infrastructure, Yi Wang, University of Guelph, Ph.D Thesis 2014: identifies 24 significant increases and 41 significant decreases. vi. Waterloo Sanitary Master Plan, Volume 1, Appendix A Climate Change, Stantec, 2015. The study did not identify any rainfall intensity changes but adopted a different rainfall pattern to be more conservative in design. viii. Short Duration Frequent Rainfall Show No Change in Southern Ontario IDF Design Intensities - No Change in Averages Suggests No Change in Extremes, Muir, 2018. This analysis of Environment and Climate Change Canada’s IDF statistics from 1990 to the current Version 2.3 Engineering Climate Datasets shows no change in 2-year to 10 year 5-minute to 2-hour rainfall. - to date, there is no evidence that rain storms are more severe." Based on Ontario data, including that of an esteemed Professor Emeritus at the University of Guelph whose academic research and training is in the field of engineering, rainfall is not a driver in flood risk and in fact many decreasing intensity trends have been identified.